Tag Archive | "Scarlet Livebearers"
The Scarlet Livebearer (Micropoecilia picta) is a highly sought after, brackish water guppy species known to tropical fish keeping enthusiasts as the Swamp Guppy, Painted Guppy, or Barrigudinho Guppy. They are distributed throughout Central and South America, from Trinidad to the Amazon River Delta countries of Brazil, French Guiana, Guyuana, and Trinidad Tobago. Scarlet Livebearers are found in the mildly brackish water marshes, swamps, drainage ditches, and canals of their range where they primarily feed on mosquito larvae, small crustaceans, algae, and plant foods. 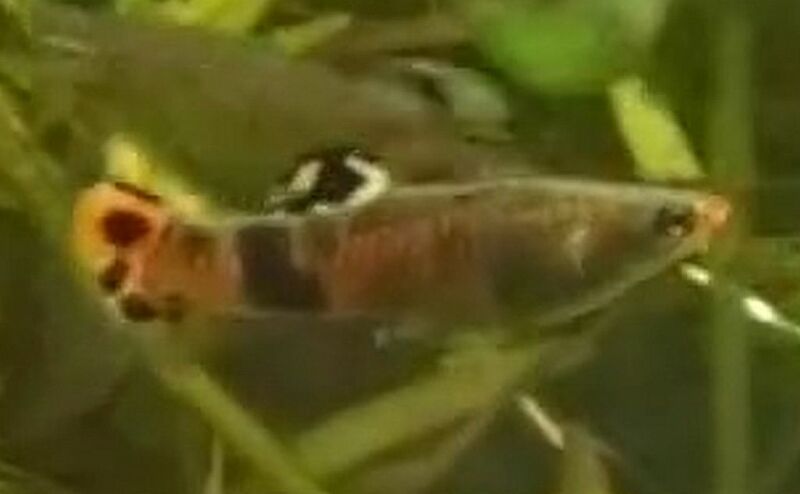 Scarlet Livebearers have a striking red to orange body color that is dramatically accented with black markings, making it a highly desirable species. Males are smaller and have a base body color that ranges from silver and green with black, yellow and blue spots to a red base color with yellow and black spots. Male Scarlet Livebearers are also more slender and brightly colored than females, and have a gonopodium. Females are larger, fuller bodied, and have a silver base color with some gold points or orange around the abdomen. Like female Poecilia reticulata, they develop a spot during pregnancy. Micropoecilia picta prefer hard, slightly brackish, alkaline water conditions and are prime candidates for a biotope aquarium setup. They can be kept in fresh water with a slightly alkaline pH of medium hardness, but they thrive in brackish water. They cannot tolerate soft, acidic water conditions. Large tall salt tolerant plants and a couple of pieces of bogwood will finish the setting and help bring out their colors. A minimum of one teaspoon of aquarium salt per gallon of aquarium water is recommended to keep these fish healthy, and a bright “grow” light is suggested to enhance their rich iridescent colors and to promote algae growth. Scarlet Livebearers are an active, extremely peaceful species that spend most of their time at or near the waters surface. But, because they constantly harass females, it is recommended to keep at least three females to each male in a single species tank. They are a shoaling species that do best with others of their own kind, and at least 8 to 10 should be placed together in a biotope system. Tank bred specimens can be housed with Endler’s Livebearers, Rainbowfish, Danios, small Gouramis, and other small to medium size aquarium fish that are salt tolerent in a community setting but a slightly brackish biotope setting is recommended. As their name implies, the Scarlet Livebearer is a Viviparous species. Their fertilization is internal and their reproduction is similar to Poecilia reticulata. When the female is able to reproduce, a spot develops on her abdomen and the male uses his gonopodium to fertilize the female. 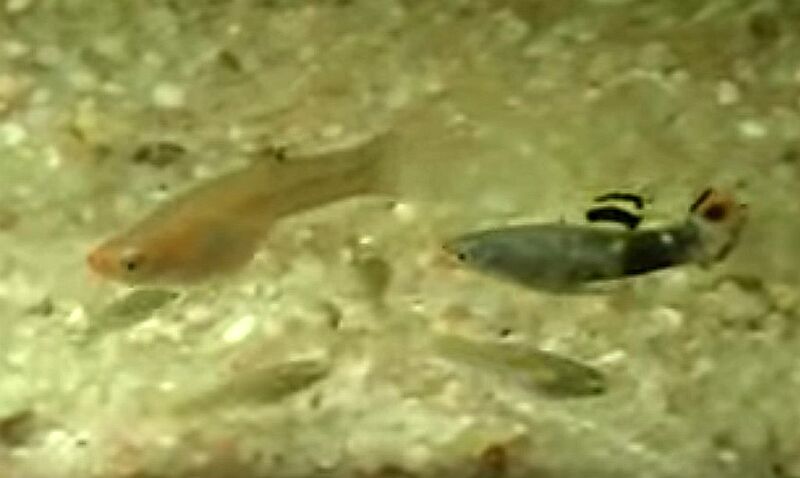 The fry are able to swim freely immediately after being expelled from the female and are able to eat shortly thereafter. , or finely crushed omnivore flakes almost immediately after birth. Adult Scarlet Livebearers are omnivores that require algae in their diet along with live, frozen, or freeze dried meaty foods like bloodworms , mosquito larvae, tubifex , etc. Smaller than Poecilia reticulata and a slightly less prolific breeder, the Scarlet Livebearer is rarely available to tropical fish keeping enthusiasts. When available they are usually 0.75″ to 1″ in length and demand a premium price. Their continued lack of availability in the aquarium trade and their dramatic coloration continue to make the Scarlet Livebearer one of the most highly sought after species of guppy.